Review: "The Quiz Show Scandal" distinguishes itself by a vividness that you seldomly get to see from Korean movies. This may also go hand in hand with a certain lack of refinement, but that's also the handwriting of director and writer Jang Jin who first and foremost once again succeeds in achieving one thing: to create a comedy that will in fact manage making you laugh. Apart from that the wonderfully written characters are appealing, too. Moreover, Jang Jin loves to shift his focus without making his movie feel incoherent because of it. Nonetheless, you might not really wrap your mind around how he manages for us to eventually sympathize with a man who in the beginning shoots a man in cold blood. Maybe that's also a sign that this comedy just wants to be fun in the end and nothing more. Jang Jin, who with his fantastic screenplay to "Going by the Book" delivered one of the best Korean, but sadly not that well-known comedies to date and also shot a very refreshing rom-com with "Someone Special", shows his A game in the departments he needs to. The humor hits right on the spot and works splendidly with its different kinds of individuals and their special character traits. Jang Jin's sense for his characters and the timing regarding the humor is displayed at its finest during the rather long introduction of the different personalities at the police station. The actual highlight of the movie is thus already bringing us closer to the characters and also toys skillfully with a few facts that are picked up again later on and are part of a few twists. That the film also seems a bit rough around the edges becomes particularly apparent concerning its directing, which at first glance isn't just unspectacular as we are used to from Jang, but also features a few unusual camera angles and some zooming in and out of scenes. That's not really annoying and also gives the movie a certain handwriting, but sometimes it also has something amateurish about it. What's fascinating here is how confidently the director works through the different focal points of his movie. There is a bit of drama, a declaration of love and a bit of a mafia flick, whereas concerning latter one the tone clearly shifts to dark humor. Actually a bit annoying at times is the well-meant, but somewhat hyperactive score. A little bit less would have been more. Especially since Jang does approach things more subtle in other respects. Particularly when it comes to criticizing Korean society. In "The Quiz Show Scandal" there is a lot which is made fun of. But only along the way. Standing in the focus are the characters, and the fact that every one of them is special and not just another face which you are soon to forget anyway is an outstanding achievement. Of course this is also the effort of the actors, of which some are brought on board by Jang Jin for a few short cameos - for instance parts of his regular cast like Jeong Jae-yeong or Shin Ha-kyung. However, to be seen in the leading roles are Han Jae-seok, who normally plays in drama shows, Lee Ji-yong, Kim Soo-ro ("Big Bang") and Ryoo Seung-ryong ("The Piper"). They manage to depict very unique personalities that also make us overlook their human shortcomings and maybe it's exactly those that make them so likeable. 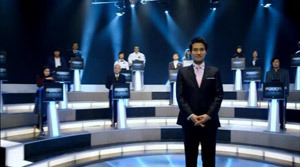 "The Quiz Show Scandal" easily could have run the risk for the second half centering around the quiz show to stand as some sort of style breach when looking at the rest of the movie. But that's not the case. Jang Jin can do what nearly no one else can: mix genres or rather make a detour into other genres without the film feeling broken apart. Furthermore, the screenplay has a few smart side blows in store - some of the jokes are actually even quite ingenious. Accordingly, moviemaker Jang is in great form, only as a director he seems to be in need of some more polishing. Which the sudden ending is proof of as well. Still, everyone appreciating a good comedy has to watch this movie. It's not just exquisitely entertaining, but under the surface also hides a bit of criticism on Korean policy, nationalism or simply what our perception of intelligence is.